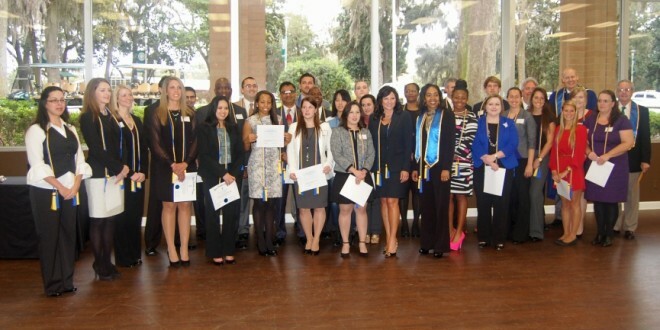 The Jacksonville University chapter of Beta Gamma Sigma (BGS), an international business honor society, has been awarded an Exemplary Chapter Award for the 2013-14 school year, the highest honor for any chapter. The Exemplary Chapter Award signifies that a chapter achieved at least a 70 percent membership acceptance rate during the school year. Nominated students must be either rising or current seniors in the top 10 percent of their graduating class, or in the top 20 percent of their graduate classes. “Beta Gamma Sigma members are considered the ‘best of the best’ in business” said Dr. Angela Mattia, Assistant Professor of Decision Science & Information Management and the advisor for the Davis College of Business BGS Chapter. Jacksonville University’s chapter has inducted 178 members since its inception and welcomes new members each spring. This is the third year in a row the chapter has been honored, achieving Primer status the previous two years since its chapter was established in 2012. Beta Gamma Sigma recognizes excellence among all of its chapters, and only schools accredited by the Association to Advance Collegiate Schools of Business (AACSB) are eligible for membership. BGS currently has 546 active chapters and has inducted more than 750,000 outstanding students into membership since its founding in 1913. Members currently reside in all 50 states and more than 160 countries.